Superheroes are an absolute staple of the online slot machine world these days. 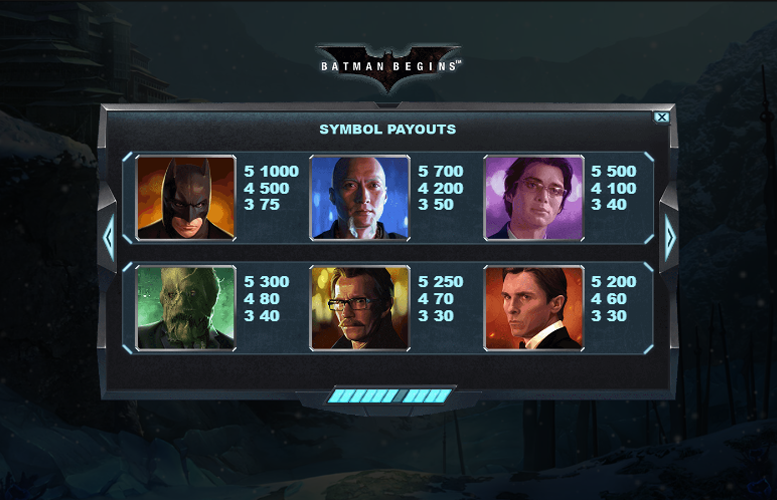 It therefore comes as no surprise that the 2005 movie Batman Begins has been made into a slot machine by Playtech. The veteran slot design team have really excelled themselves too with the innovative special features, excellent artwork, and lucrative prizes. 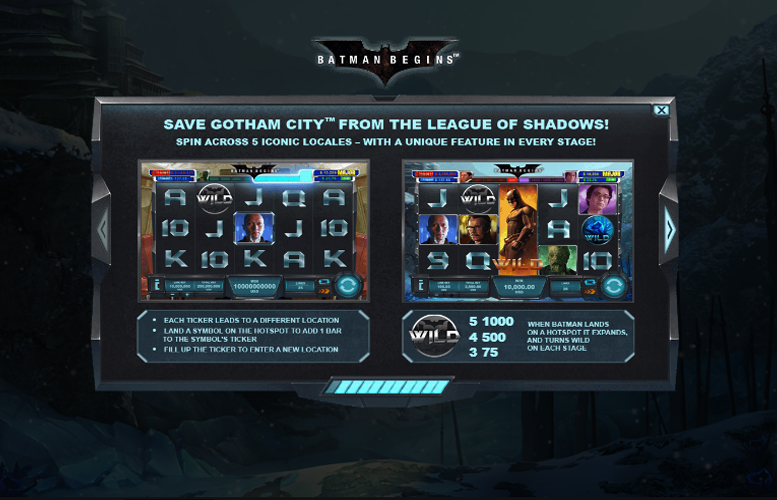 All of this combines to create a slot that’s worth playing whether you’re a big Batman fan or not! Hugely diverse gameplay. With five different locales to play through and different features on each, the action is always fresh. Large main game prizes. We love to spin in big wins during a main game! Progressive jackpot. If the regular game prizes were exciting wait until you see what you can drop in the DC progressive jackpot round! Great artwork and true to original content. Low upping betting limit. Granted, not everyone will agree with this criticism, but we struggled to find anything else with Batman Begins! Batman = 1,000x the line bet. Ra’s al Ghul = 700x the line bet. Dr Jonathon Cane = 500x the line bet. Scarecrow = 300x the line bet. Commissioner Gordon = 250x the line bet. Bruce Wayne = 200x the line bet. 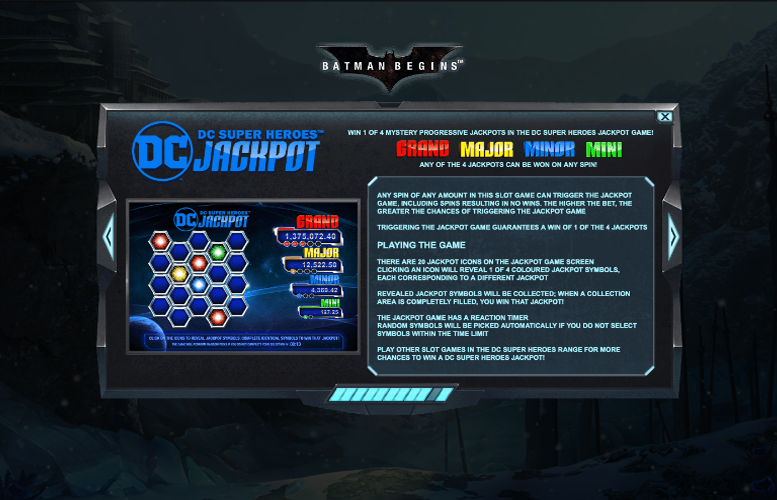 On top of the regular payouts there’s a progressive jackpot prize on this slot as it’s interconnected with the DC Comics jackpot pool. The action takes place across five different locales from the movie. Each of these features a different bonus mode too. Each ticker leads to a different stage. You’ll find the ticker at the top of the gameboard. Landing a symbol on the hotspot will add one bar to the symbol’s ticker. Once the ticker is filled, you will transport to the next location. 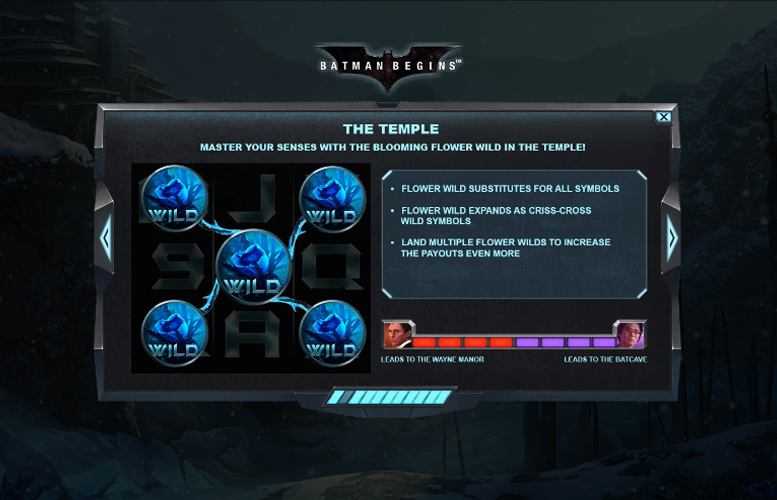 During the temple stage, a flower “wild” symbol will substitute for all symbols. These flower “wilds” will expand as a criss-cross group of “wild” symbols. Landing multiple flower “wilds” will dramatically increase the size of the payments made. Filling Bruce Wayne’s ticker up will transport the action to Bruce Wayne’s mansion. Here, the bonus feature is petrol “wilds”. These symbols will engulf the reels in flames and transform every symbol in its path into a “wild”. Filling up Dr Jonathon Cane’s ticker entirely will transport the gameplay to the Batcave. Here, the special feature is a shifting Batmobile “wild”. During the Batcave stage, the Batmobile “wild” will substitute for all symbols. Landing one will trigger a respin and move the “wild” one place to the left before the respin. The respins continue until the Batmobile symbol shifts all the way off the reels. Filling up Scarecrow’s ticker will take players to Arkham Asylum. Here, the bat-signal is the “wild” symbol. This will randomly turn symbols into “wilds” and create higher wins. Also, a random multiplier is assigned to the “wild” symbol. This can be up to a massive 50x! Completing Commissioner Gordon’s ticker will take players to the Monorail stage. In this locale, the “wild” symbol is a microwave. Like the other “wilds” it can substitute for all symbols. It will transform random symbols surrounding the highest-paying symbol around the “wild” to create potentially huge wins! One of four mystery progressive jackpots can be won on the Batman Begins slot. This side game is triggered randomly, and any single spin can activate it. However, larger bets stand a greater chance of awarding the random progressive jackpot stage. 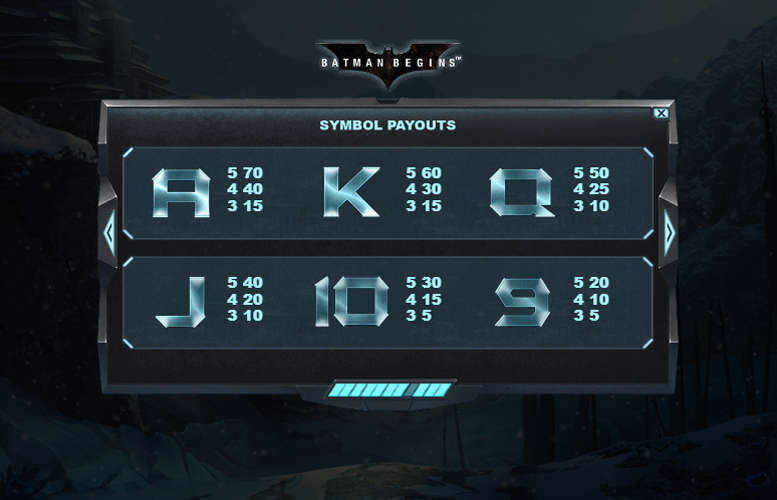 To play the progressive jackpot mode, players simply select from 20 Jackpot symbols until they uncover three of the same. The available jackpots are referred to as: Grand, Major, Minor, and Mini. Players are guaranteed to win one of these each time they visit the progressive jackpot round. When the Batman symbol lands on a hotspot, it expands and turns into a “wild” symbol on each of the stages. Ace = 70x the line bet. King = 60x the line bet. Queen = 50x the line bet. Jack = 40x the line bet. Ten = 30x the line bet. Nine = 20x the line bet. The number of win lines on the Batman Begins slot machine is fixed at 20. Players are only invited to adjust the amount bet on each one. Here, the minimum amount is just 1p and the maximum is £10. This means, with all values set to their minimum or maximum, the lowest and highest bet per spin on Batman Begins is 20p and £200 respectively. 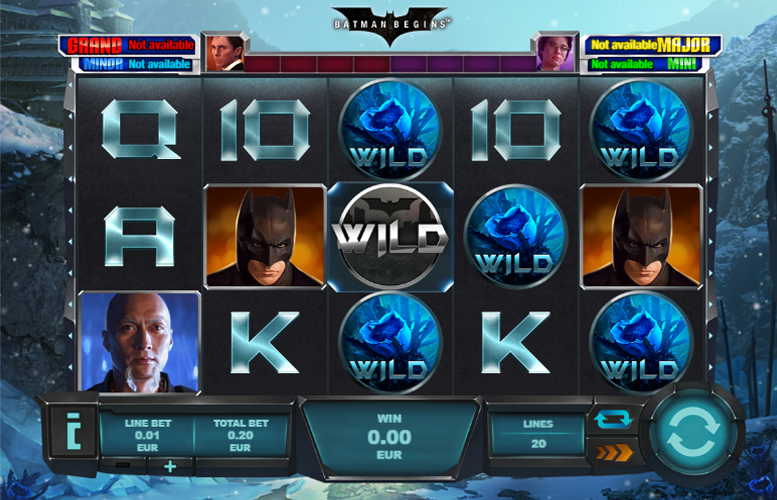 In case you couldn’t tell already, we really enjoyed testing the Batman Begins slot machine from Playtech. The game seems to have it all – great prizes, exciting and diverse bonus features, and all the atmosphere of the original content. If you’re a big fan of Batman movies or simply love an excellently designed slot machine, we can highly recommend Batman Begins. This game has a rating of 5 / 5 with 803 total reviews by the users.